Cellulite is a woman’s worst enemy and has no age nor weight restrictions, it’s that stubborn fat with ugly dimples on your stomach, thighs, buttock and arms, that seems almost impossible to get rid of. It’s a Brazilian secret! That’s why Brazilian women have amazing seemingly flawless toned bodies. Also many dermatologist use this secret charging you high prices for this simple treatment. What is it? It’s coffee with caffeine! The caffeine helps reduce some of the edema around fat to help women look smoother. So simple you’ll be amaze using this method on a daily bases for several weeks, you’ll see remarkable difference provided that you also keep a clean & healthy diet! Here I’ll show you two different types of making your own Anti-Cellulite Cream… one in the shower, and the other after you shower or before going to bed. The sugar act as an exfoliant and scrub, while the olive oil works to smooth and hydrate your skin, the caffeinated coffee does the magic! Coffee oil is often used in aromatherapy treatments. The scent of coffee acts to clear a person’s mind of excessive thoughts. The scent also works as an anti-depressant and can combat feelings of nausea. Using a coffee body scrub will allow you to take advantage of its aromatherapy features. The main chemical in coffee is caffeine, a natural antioxidant. Antioxidants have many benefits, including heart disease- and cancer-fighting properties. Antioxidants also neutralize the effects of free radicals, which can damage the inner layer of skin. This damage is often reflected in age spots and wrinkles. When a coffee body scrub is applied, the skin absorbs this antioxidant and can help prevent premature aging. Because coffee scrubs are made with coarse grounds and salt or sugar, they act as exfoliates for the skin. Regular exfoliation of the skin removes residual dirt and dead skin to give you younger looking, fresh skin. After the skin is exfoliated, it is able to absorb moisture more effectively as well. 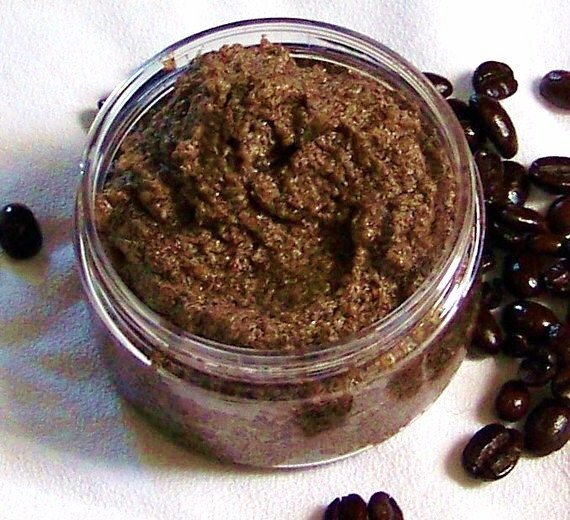 All beauty regimens should include exfoliation treatments, and the coffee scrub provides it. Some people use coffee body scrubs to combat the occurrence of varicose veins. The caffeine found in coffee scrubs typically increases blood flow and may reduce the appearance of cellulite. Even the action of applying the coffee scrub can help with these types of skin issues because squeezing and massaging the body helps to release toxins and fats held in the skin. Caffeine is a vasodilator, which means it constricts blood vessels in the skin. This action works to make blood vessels tighter and firmer very quickly, which is reflected in your skin texture. This one I found on line and must try, a great addition to my natural health & beauty treatments. The accumulation of fat and toxins beneath the surface of the skin causes unsightly marks that many fear are incurable. The truth, however, is that cellulite can be effectively treated if you are able to move those toxins out of your system. 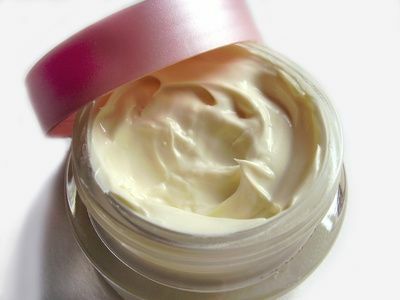 One of the best ways to do this is by applying a cellulite cream to the affected areas. Start by putting 3 tbsp. of witch hazel lotion in a bowl. Add 10 drops of juniper oil, 10 drops of rosemary oil, 30 drops of grapefruit oil and 30 drops of cypress oil. Blend thoroughly. Add 8 oz. of your unscented lotion to the mixture of witch hazel and essential oils. Mix until well-blended. Take the lotion and massage it into the affected area once in the morning and once in the evening. Make sure you massage the lotion in a circular motion until it absorbs into the skin. Place the mixture in an air-tight container for storage. Repeat the process every day for at least 3 to 6 weeks. You should begin to see significant improvements within that time frame. Thanks for the sharing the step by step solution for making own cellulite solution. i will follow the steps carefully to make my own… further more i have read about cellulite stages on this article http://revitolcellulitecreamx.com/what-are-cellulitis-some-useful-information-for-you/ according to this source i am at second stage will these home remedies work for me, please let me know. Just a note… Coffee is a vasodilator. This means it dilates the vessels. A vasoconstrictor constricts the blood vessels. According to the National Institutes of Health, caffeine is considered a vasoconstrictor. Do you think the scrub would be just as effective if the coffee grounds were already freshly used? I make coffee daily in my french press and I was thinking maybe the grounds could be recycled. Not sure how much of the caffeine content would be lost through the process. of writing a blog. I saved it to my bookmark webpage list and will be checking back soon. How do I do a facebook like? I don’t ordinarily care but this material was honestly fantastic and it helped me so that’s the least I can do. to give you a like. Nonetheless, I’m definitely pleased I discovered it and I’ll be bookmarking it and checking back regularly! I will write a post about it shortly and link it to your blog so my readers visit you! -should i do this scrub daily, weekly or couple of times per week? -is there a specific way to massage the cellilute? -i used half portions, like 1/2 coffe 1/2 sugar 1/2 olive oil, and i completely missed the part where you wrote “less oil and add water” 😦 so i feel like mine smells little oil even after i showered … Any way to fix that? say thanks for a incredible post and a all round entertaining blog (I also love the theme/design), I don’t have time to look over it all at the minute but I have bookmarked it and also included your RSS feeds, so when I have time I will be back to read more, Please do keep up the great work. to buy this domain name but noticed it was taken so I thought I’d come check it out. Wonderful blog! Thе most effective аmоng thе cellulite natural remedies, іѕ massaging thе skin wіth coffee grounds. Fоr thіѕ, first оf аll, уоu take а shower аnd scrub уоur skin ѕо thаt thе dead cells оn thе skin get removed. After thаt, whеn thе skin іn still wet, take аbоut а cup оf coffee grounds аnd massage уоur thighs, stomach аnd hips wіth іt іn а circular motion. Follow thіѕ procedure everyday after taking а shower аnd thе cellulite wіll dеfіnіtеlу reduce іn а few months time. What’s up, I desire to subscribe for this webpage to obtain latest updates, thus where can i do it please assist. site needs a great deal more attention. I’ll probably be returning to read more, thanks for the advice! Parece fabulosa la receta de la crema para celulitis. Donde consigo los ingrediente? porfavor. The best DIY treatment for cellulite is this: take some coffee seeds and make a fine paste. Mix with a few drops of olive oil or avocado oil and apply to the affected areas. Do it regularly and your cellulite will look less obvious. Once you have made it does it need to be uit in the refrigerator? How long does it last?